Our Practice - Fair Vision, Inc.
Dr. Fair grew up in Genoa, a small town near Toledo. He did his undergraduate study at Bowling Green State University. He attended Ohio State University Optometry School and graduated in 1984. He moved to Carrollton in the summer of 1984 and joined Dr. Rankin in practice. 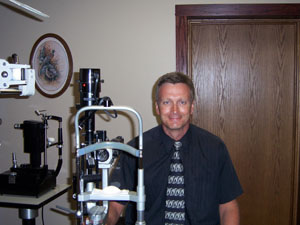 He thoroughly enjoys all of his patients and provides total eye care for the whole family. Basic eye exams, glasses and contacts, eye health evaluations and treatment of eye diseases are all included in his comprehensive care. Dr. Fair is married to Bobbi and has a daughter Taylor. He welcomes you to the practice.